Herod Antipas, the son of Herod the Great, is mentioned along with Caesar and Pontitus Pilate at the beginning Luke's Gospel devoted to St. John the Baptist's public ministry. Herod is tetrarch of Galilee. Inevitably John antagonizes the ruler by his preaching and his criticism of Herod's marriage to the divorced wife of his brother. Herod arrests John. But while keeping him in prison, he fears executing the holy man. Almost everybody seems to know the rest of the story. It is one of the most famous moments in all art. There is a great feast on Herod's birthday. Salome, who is the daughter of Herodias, the second wife, dances for her stepfather. He is so pleased he offers her anything she wants. She asks her mother whose hatred of John is intense. Herodias says ask for the Baptists head... When the head is brought to Herod during the feast he and the rest of the company are rightly appalled. 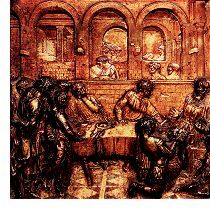 Donatello's bronze relief of the Feast of Herod (right) is justly famous.